The Component Master window shows a list of all components in the system based on the type selected in the show drop-down. From this screen, you will be able to sort components by name, cost, on hand amount or on hold amount. The Component Master window will also include all ingredients and materials that are available or were available through your facility to complete a requested manufacturing job. On this screen, you have the ability to search for a specific component or show anywhere between 10 and 200 components per page. Any search that is entered will only show results depending on the current type that is selected in the show drop-down. The number of components shown can be adjusted by choosing your requested amount in the drop-down at the lower left corner of the window. PRs With… – Shows all production records that have the selected component in them. Holds On… – Shows all orders that have the selected component and holds in the system that are active. 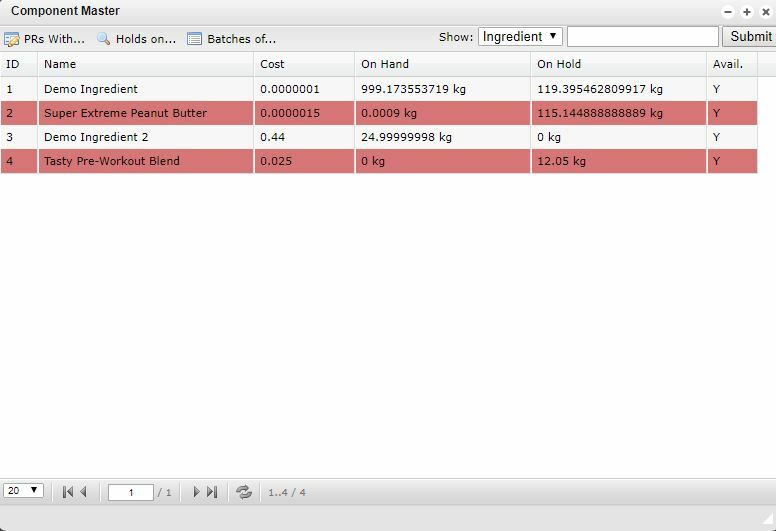 Batches Of… – Shows all batches that include the selected component.